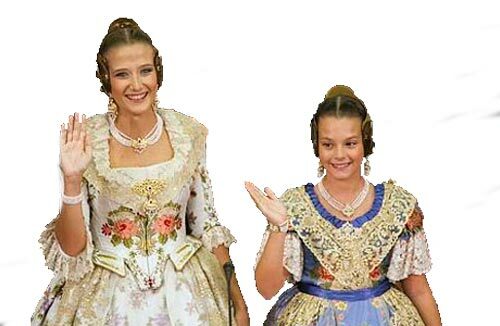 Apart of the dress and ornaments, the fallera’s hairstyle – so called Fallera hairdo – is a very important feature of the Fallas during the celebration in Valencia. 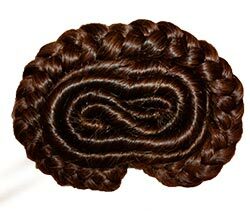 This hairstyle basically consists of two spiral chignons or buns placed on every side of the head (towards the part of the ears) and two braids rolled around the back of the head forming a major bun. To adorn the hairstyle three hair-clasps are often used. 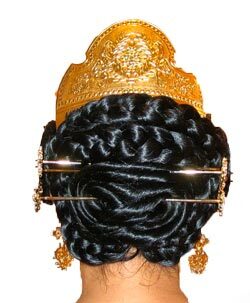 Usually they are organized as follows: the two smaller hair-clasps decorate the buns on left and right sides of the head and the big one is situated on the rear part adorning the chignon formed by braids. Pins are used to hold fallera’s hairstyle. With a ceremonial dress of cultivator the buns are three. With an 18th-century costume the buns are three or one. And finally with the suit of farmer the bun is one.